It doesn’t matter what the industry is, there’s always more work to do than time to do it. This means that there is always something lacking, always more work to be done, and new companies are always falling behind their expectations and deadlines. One of the most insidious parts is that it leads to massive stress. According to business coach Michael Hyatt, 45% of entrepreneurs are stressed. So, what’s an overworked entrepreneur to do? There are plenty of answers, and not every one works for every type of entrepreneur. But the answer more and more business owners are turning to is a simple one: outsourcing. Outsourcing is giving your work to someone else outside of your main business. That could be through freelancing, or by hiring another firm (like a call center) to handle segments of your business. You could even outsource by shipping a business process like manufacturing overseas. For most small business owners, however, this simply means having someone outside the business do work. But the inevitable question arises: how you do you make sure the quality stays the same? Other people outside your company don’t have the same understanding of your cultural values and the same drive to produce high-quality work, right? In this guide, you’ll learn everything you need to know about outsourcing, while avoiding mistakes that could cost you in quality. But before we can cover specific strategies, you need to know why you want to outsource. At the end of the day, the only reason you should outsource should be because you can make more money by outsourcing than by not outsourcing. While it may sound exciting to outsource, it doesn’t make sense unless it makes financial sense. In the same way, outsourcing isn’t a method to do more nonessential tasks. You should only use outsourcing as a tool to drive sales and revenue. That said, it helps to look at where you could improve in your efficiency and revenue generation through outsourcing. According to Wasp Barcode Technologies, the five biggest challenges facing small businesses center around employee management and profit. They are hiring new employees, increasing profit, employee healthcare, growing revenue, and cash flow. Any outsourcing you do should help you reach three of those goals (increasing profit, growing revenue, or increasing cash flow) while bypassing new employee hassles. Here’s how to find out exactly what you can outsource and what you can’t. I recommend taking a hard look at how you’re spending your time currently, and adjust based on what the data tells you. To get started, I recommend you track your time with RescueTime. It’s a simple app that lives hidden on your computer and tracks your productivity. After you’ve run it for a few months, find what tasks to outsource. To review where you’re spending your time, click on the RescueTime icon in the menu bar. Select “Go to Dashboard…” from the menu. On the dashboard, you’ll be presented with an overview of how you’ve spent your time. Click on the upper right-hand corner option for Reports. Select Applications & Websites. Choose the timeframe you’d like to view. From this, you can see what areas required most of your time earlier. Typically, the biggest areas are your core competencies. Unless you’re massively mismanaging your time, these are areas where you excel. As you look toward other programs that take up your time, however, you’ll probably notice activities with a lower overall quality. These are activities with diminishing returns. Typically, these are your best candidates for outsourcing. The second method to understanding opportunities for outsourcing is by looking at areas where you (or your current employees) don’t excel. This provides you with huge benefits. First, you’ll be able to have these tasks done by someone who is more adept at them. This means you won’t have to worry about your employees messing up on a task they truly don’t understand very well. Second, you’ll be able to achieve these tasks with an economy of scale. If you need an ad run, for example, you can hire an agency with a full-time videographer, designer, and public relations manager. This is more cost-efficient than hiring all of these employees on a part-time basis, or expecting one full-time employee at your company to understand each of these skills. Third, you’ll be able to focus on what’s most important. At its heart, focusing on the core competencies of your business and delegating the rest is really what makes for a successful company. Most of the time, this will be the biggest benefit of your outsourcing. By letting someone else handle your payroll or other task, you can dedicate your time to shipping a better product. Focusing on core issues was the top reason for outsourcing, tied with reducing operation costs, according to Link Vista Digital. So now that you know what to outsource, there are a few pitfalls you need to be wary of. These are areas where you should actively seek to avoid outsourcing and hold them close to your main business. Despite the temptation to outsource, there is such a thing as too much outsourcing. If you start letting others handle the tasks where your company excels, you can lose ground. If you can outsource everything, then your competitors are only a few freelancers away from beating you at your own game. First, you should make sure something isn’t your core competency. While you may think this is your core business, a core competency isn’t necessarily in the products you produce. There are plenty of authors who have ghostwriters write their books. But since they maintain the basic ideas and framework that makes the books successful, the model works for them. The secret is really in your competitive advantage. What sets you apart? What makes your product different than everything else out there? What passion, focus, or choices define your business? The perfect example of this is Apple. While Apple outsources most of its manufacturing, the design is still done in-house. Anybody can make a smartphone, but only Apple can make it look like an iPhone. If you know something is not a core competency or part of your competitive advantage, there are two questions you need to ask. First, is this just something I’m doing to save money? Oftentimes, there are good reasons to outsource that involve money. But there are also times when the money is well spent. If you’re considering outsourcing your customer service to save money, for example, you’ll likely grow in frustration. Not every task is purely based on the money at stake, and you may actually lose money in the long-term by only focusing on money in the short-term. Finally, you need to ask if this is just because you don’t like doing a task. While it can be nice to think of outsourcing a project that you don’t want to do, this is often a mistake. Critical parts of your company, like sales or hiring, are often the least fun parts of an entrepreneur’s job. But if you outsource these, you’ll start to notice a difference in the company. These are skills you’ll need to learn (or hire someone who can learn them), and outsourcing simply isn’t a long-term solution. Now that you know what to outsource, let’s start with the first level of outsourcing. Technically, this isn’t hiring another person to handle your tasks for you, but it’s a great way to reduce the workload. The advantages of software are numerous. It’s usually much more affordable than an employee, and technology won’t take breaks or stop working (usually). Because of this, you should always seek a software solution before a human solution. Here are three areas to look for when you’re considering outsourcing to computers. A surprising number of rote process can be digitized. If you noticed that you’re spending any period of time doing something over and over again on the computer, there’s a good chance you can switch these over to software. The time saving to be gained is no small feat. 94% of marketers who automate say it has improved their company’s performance, according to MDG Advertising. There are a handful of tools that can make your life simpler. For basic tasks, I recommend the free tool IFTTT. IFTTT stands for If This, Then That. It handles basic integrations with your email program, Google Docs, and hundreds of other pieces of software. It’s a great way to record your invoices, share posts across social media, or get a text notification if an important client emails you. While most of the tasks it handles seem small, they can add up quickly and save you countless hours each week. More advanced tasks call for a more advanced tool, and that’s where Zapier comes in. Zapier is, at its heart, a more complex version of IFTTT. Unlike IFTTT, it’s not free, but the software functionality more than accounts for its price. With Zapier, you can send bonuses to customers who email you, categorize and log customer feature request emails, and import new Stripe customers into your CRM. If you spend a few weeks buildinging frequent systems into Zapier, you can easily save an extra few hours or even a part-time position with automation. But what is something truly require a human touch? Well, you might not be able to automate it, but you can probably shorten the time it takes to complete. Not every task has to be eliminated entirely for it to work at peak performance. IF you can use technology to shorten a task, it might transform it into something that doesn’t require outsourcing or other form of extra labor. One of my favorite tools for this is TextExpander. This is a simple tool that will auto-expand snippets of text. If you use a common header for your articles, for example, you can type a few keys and have it auto-populate the phrase. It’s a lifesaver that can shave off weeks, one minute at a time. For example, if you write a common response to your most popular emails, you can reduce your email time from an unwieldy two hours to a manageable thirty minutes. This takes a task that would otherwise need to be outsourced to an expensive employee and allows you to handle it with just a fraction of your workday. There are other ways to do this as well. Becoming familiar with common keyboard shortcuts and time-saving apps can save plenty of time and make some outsourcing tasks not necessary at all. But there’s one more reason you might want to use technology to help: managing the asynchronicity problem. At its simplest, the asynchronicity problem is that you can’t work at all times. There’s a simple issue with being in real-time and not being able to work in real-time. To fix this, you can use technology that mimics real-time interaction without your need to control it. The most common example of this is social media. With social media needing constant interaction, it doesn’t make sense to provide the constant attention it demands. I recommend using marketing automation to save hours of work, while getting the same amount done. There are a variety of tools that make this easier. One I recommend is Hootsuite, which will allow you to prepare social media updates in advance. A more unique option is Edgar, which allows you the ability to schedule posts that continue even after your list of updates to send is empty, as it will recycle through a library of content. And finally, Buffer allows you to set up a queue of posts that you want to share on a variety of social media channels. These tools allow you to work asynchronously with the time constraints you have. In other words, you can put in a set block of time and reap the results at other times later. This is helpful if you’re looking to outsource a project to someone simply because you don’t have time. By batching these tasks you may be able to reap the benefits you thought you needed with another employee. Finally, you can work asynchronously on email as well. Using a tool like ContactMonkey, you can easily schedule emails to delay and send later. This allows you to send new leads throughout the week without needing to schedule them each day. But software has its limitations, and you may find that you need to outsource your tasks to humans to do more advanced work. Here’s where you can start. Sometimes there are processes and systems your business needs that you simply shouldn’t handle on your own. For example, every business needs to file taxes each year. But most small businesses choose to outsource this to an accounting firm or CPA. Because this kind of specialized tax know-how is something a small business only needs a few times a year! It’s much cheaper to hire out that part of the business instead of hiring a new employee who doesn’t have enough to do most of the year. Here are the major business systems you should consider outsourcing. For each of these, I recommend looking into an established firm. The level of expertise for each of these areas is important and may even have legal requirements, so it’s important to choose a company you trust. For these areas, you should not browse freelancers online. Instead, look carefully for a firm that meets your needs. Depending on your situation, consider the following criterion. Local. If you’re a local business in need of constant communication, you should look for a company in the area. This is also applicable if you will need the firm to be physically present, whether it’s for setting up a new IT system or scanning last year’s tax documents. Expertise. Sometimes, your industry is so specialized, you need a firm that serves your specific needs. Companies that work with a niche, like HR management for tech startups, will be able to understand your unique needs best. Experience. This is a must for any company that deals with important information, like taxes or legal paperwork. Whatever firm you decide to use, look for a company that knows what they’re doing and has references and data to support their claims. The most common example of business outsourcing is finance and accounting, or F&A. The problem isn’t just in the amount of time an in-house team has to dedicate to the work. Larger accounting firms can afford software and resources that in-house employees will never have access to. This lack of resource is a major struggle for teams with in-house F&A staff, according to Consero. As a result, numerous small businesses outsource this kind of work. While many pursue local options, like an accounting firm down the street or a CPA recommended by a friend, more and more businesses are using online services. Timber Tax, for example, specializes in taxes for freelancers and consultants. This specialization makes them a perfect fit for freelance entrepreneurs who may not have a specialized CPA in the area. While it might seem crazy to outsource the management of the employees that make up your venture, human resources is quickly growing into a prominent outsourcing industry. Outsourcing through HR service providers grew by 27% in 2016, and most HR service providers expect that growth to continue, according to Prism HR. If you’re a small company without a large staff, this may be a trivial place to start. As any large company can attest to, however, HR can be a massive expense in terms of both time and money. Consider outsourcing this to focus on the core of your business. While businesses of the past usually relied on in-house IT personnel, today’s companies see the value in outsourcing this part of the puzzle. Though it’s nice to have a full-time employee handling issues when they arise, it can be an extra unnecessary expense. Currently, outsourced IT work like project-based and statement of work (SOW) tasks are now equal to staff increases for IT work, according to TekSystems. If you haven’t already started outsourcing some of your IT needs, go ahead and begin now. Few small businesses have the legal expertise in-house to handle the increasing number of requirements local and national laws demand. For the more challenging parts of your business, consider hiring an outside attorney for legal advice and consulting. Legal process outsourcing is on the rise in almost every subsector, according to Cogneesol. This is one of the areas where experience and locality are critical. Be sure to find a firm that is well-versed in the specifics of your local laws and has a track record of giving successful advice to businesses similar to yours. The best place to start with outsourcing is by letting someone else hand auxiliary business tasks. These are tasks that are an integral part of your core business, but aren’t part of your competitive advantage. While these don’t always have to be outsourced, it can be a wise idea to do so. If you do something in the same way every day, there’s a good chance you can find someone else who can do it for less, give it more focus, and improve your efficiency. To calculate these tasks, I recommend calculating your wage per hour. Estimate how much time you’re spending on your most important tasks, and whether or not you could hire someone for less than you’re effectively getting paid for those tasks. Once you know what your least critical tasks are, and delegate as you see fit. Simple projects like data entry, calculations, and formatting can be handled by others. To get this started, find a task you do often. The best way to outsource it is by creating a screencast of the project. If you’re on a Mac, I recommend Tapes. You can quickly create a screencast demonstrating the exact procedure for this. Once you have the procedure recorded, have another person write it up into a procedure. This is a document you can use as a resource moving forward. Using this procedure, the person who you outsource the work to can complete the tasks quickly and painlessly. Of those companies that have outsourced data entry, 82% say it enhanced their overall management, according to Cogneesol. Unless you’re a website development firm, there’s really no reason to maintain your own website. As mentioned earlier, this is something that another company can do for a better, more cost-effective measure and you can pay for with economies of scale. If you’ve already designed your own website, look to outsource this work next time you need to update. Perhaps the biggest opportunity for outsourcing is through content generation. This is a great way to start with outsourcing especially if this is a new area for you. 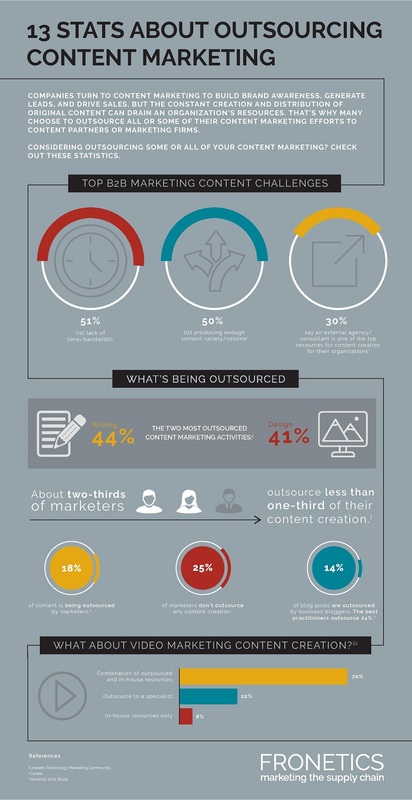 The most common outsourced content marketing activity is writing, with 44% of marketers using it. As I’ve mentioned before, it takes tons of work to write and promote content that goes viral. Having an experienced writer or promoter do the heavy lifting can save you tons of time. However, there’s still room to grow, with two-thirds of marketers outsourcing less than one-third of their content, according to Fronetics. If you currently have someone creating content for you–or if you do it yourself–you can almost always have a ghostwriter produce content for a fraction of the price. Again, keep in mind your hourly wage and the value of your activities. Chances are, writing isn’t the most high-value activity you should be doing. For starters, you should consider outsourcing an editor to make you a more productive writer.. The secret to success with outsourcing your content is to have a few examples of premade content to support your efforts and explain what you’re looking for. You also need a clear plan of content that you’d like to produce. But how do you make sure you don’t get stuck with a freelancer who is a total flop? If you want to get a great freelancer for a specific job, there are a few steps you can take to make sure the person you hire does an excellent job. Use this three-part framework to ensure that you get someone who is not only well-qualified for your work, but will do it at a fair price. Before you look to hire a freelancer, you need to have a budget in mind. Understand that while outsourcing is cheaper, you shouldn’t be looking for the cheapest option. Software outsourcing, for example, costs a minimum of $70/hour in North America, according to Accelerance. And while you can go as low as $20-40/hour in Asia, you will sacrifice important benefits such as English language fluency and workday overlap. Before you get started, do your research. Understand exactly what you should pay for the project you want done, and know what a fair price range is. It’s also a good idea to make a list of what features are most important to you. Do you need someone proficient in English? Is clean code important, or do you only care if the final software project works? These are important questions to decide before you start receiving bids from freelancers. What a lot of entrepreneurs don’t realize is that the success of freelancers often depends on the project specifications they write. A pitch for a job with a vague description may end up with a variety of quotes. Choosing the lowest price may ultimately mean choosing the freelancer with the least amount of understanding of what the full project entails. Rather than undergo this kind of chaos, explain the precise deliverables for the project you’d like the freelancer to complete for you. The primary site for hiring freelancers is Upwork, and I’ll show you how to write a detailed description on there. If you’re using another platform, you can easily adapt these same principles. To get started, sign up or login to your Upwork account. Click on Post a New Job. You’ll be presented with the Post a Job page. If you’ve posted before, you can reuse an old job. Otherwise, move to the next section. Choose a category and subcategory. Make sure you get this right, as you might not attract the right kind of freelancers if you post in the wrong category! Now it’s time to describe the job. This is where you need to be as specific and detailed as possible. Give your project a simple and clear heading. In the description section, provide as many details as you can. If possible, I recommend attaching files to demonstrate inspirations for the project, current designs you want to emulate, or other resources for the freelancer. For Upwork to accurately select the right kinds of freelancers for the job you have, you need to select a few different parameters about the project. If you’re just starting, I would recommend doing a small piece-meal project. If something goes wrong, it’s better to have it happen on a $100 presentation design task than a $30,000 website development project. Select one-time project and one freelancer. Enter any skills he or she will need to complete your project successfully. Finally, list when the project starts. Next, you need to decide your Rate and Availability. This is where your earlier price research will come in handy. Choose how you’d like to pay and the experience level you’re looking for. You’ll also select the time frame for the job. Again, for the short job type I recommend you start with, choose a short time range (one month to one week). Decide who can find and apply to your job. I recommend the default option, though you may have higher quality results with just Upwork users. Don’t select only freelancers you invite unless you already have done a few projects. It’s best to see who’s interested first. The other questions are optional. If you feel they are important, you can specify preferred qualifications, screening questions, and a cover letter. I haven’t found these necessary for small jobs, though. Once your post is live for a few hours, you’ll start to get freelancers bidding for your job. Once you post a job, freelancers on Upwork will post bids based on your specifications. Before you choose a freelancer, you need to do your research on him or her. Here’s a candidate who bid on one of my projects. I’ve clicked on his profile to see all of his details. The three most important figures for me are his Job Success Score, work history, and languages. Job Success Score is an indicator of the feedback a freelancer receives from previous clients. At 93%, Goran J. has a solid rating. His work history tells me that he’s spent over 500 hours on Upwork with 76 jobs, which is a good amount to have a process and track record for solid work. And finally, he’s fluent in English. This makes the communication process much easier, and he’ll understand any revisions I need to make. If you want to dive deeper into customer feedback, you can review the Work History and Feedback section of the freelancer. I prefer to sort by lowest rated, to see what issues (if any) are common complaints. Since most freelancers offer revisions, you shouldn’t see many negative reviews. A slew of negative feedback usually means the freelancer wasn’t very accommodating to clients. Thankfully, Goran J. has excellent feedback. The lowest rating he’s received was “no feedback given,” and the lowest recorded score was 4.30. He’s a solid candidate based on previous experience. Now that we know he’s qualified for the job, let’s make sure his work quality matches what clients have said. Most freelancers on Upwork include a portfolio of some sort, so make sure you can review previous work. Unlike a low Job Success Score or poor customer feedback, there’s no right or wrong answer with a portfolio. You’re just making sure you like his or her style. If you follow these steps to vetting the freelancers who apply for your job postings, you’re sure to get a killer job done each time. When you first venture into the world of outsourcing, you hear horror stories of ongoing freelancers who rack up massive bills, deliver work long past deadlines, or give up on a project halfway through. This is easy to prevent for a quick foray into freelancing with a small task. But what if you have a larger, ongoing project? How can you ensure quality work while still maintaining a fair price? The answer is just as simple as landing a quality freelancer for a small project: there are a few key steps to ensure a perfect fit. Since you’ll be working with someone for a longer period of time, it’s important that he or she is a good fit for your projects. To do this, you’ll want to set up a more rigorous process for finding the right freelancers. I recommend adding a random test question to your application to weed out anyone who won’t follow your directions. Requiring a unique subject line or other kind of “password” is a great way to see who is willing to obey even small requests. To get the right person, you also need to expand your entries. Have at least three people in your sights, and choose the one that works the best for your demands. I recommend requiring a paid test project from these people. Yes, it can be expensive to pay multiple people for the same work, but it’s a good investment. It’s better to find out early on that they aren’t able to handle a project before entrusting them with mission-critical work. Finally, you should conduct a video chat interview with your shortlisted candidates. This is to ensure that they can show up to an appointment and to make sure you get along. Regular communication is vital to keeping your team aligned to the goals of your venture. Just like you should have a video chat interview at the beginning, you should keep this level of communication ongoing. Make sure he or she jives with your understanding and can show up and be available. I use Skype for communication with my remote team. Everyone seems to already know how to use it, and it’s simple to use. Another tool I’ve found helpful for work discussions with these teams is Slack. If you’re unfamiliar with the tool, it’s a messaging and chat app for working teams. This is a great way to stay updated with the newest developments on the project and make sure each freelancer is on the same page as the rest of the company. Last but not least, you need the ability to share documents. This is especially in content marketing, as edits can quickly become tiresome if you need to send documents back and forth. I use and recommend Google Docs for this, as it makes it easy to communicate with my editor over the articles I write. I’ve also found Google Drive to be helpful for maintaining large file collections. This is helpful if you have a queue for your content marketing and need to prepare content in advance. Google Drive allows you to create shared folders that everyone in your editorial team (writers, editors, publishers, etc.) can all review. Finally, Dropbox is a powerful tool that allows you to share a variety of files, from templates to logos, with other members of your team. It’s a great way to keep the branding on point and not let a freelancer accidentally use an old version of your logo. Before you begin a large project, make sure you onboard everyone with the tools you’ll be using. Provide them with accounts and teach them how to use the tools if necessary. With those basic precautions in place, you can go about with an ongoing project that’s guaranteed massive success. If you’re an entrepreneur looking to get more done in less time, outsourcing is a solution you should consider. While it doesn’t work for every situation, outsourcing the least vital parts of your work is a surefire way to increase your efficiency. If you use the right techniques and do your research, you can ensure that your outsourced work has the same impact of the projects you finish yourself. What techniques will you use to outsource without losing quality?